Learning to drive usually takes over 40hrs of tuition. Some people take more, and some take less. I will never give more lessons than are needed. Click here to find out what I will teach you. The first is a series of multiple choice questions about driving and the Highway Code. You must get more than 43/50 correct to pass. The second section is about Hazard Perception. Video clips are played and you must click the mouse when a hazard (dangerous situation) develops. You need to get at least 44 marks out of 75 to pass. Both sections must be passed at the same time. There is approximately a two week waiting list for the test which can be booked with the DSA. It costs £25 to take the theory test. I can help you with any difficult questions and help you practice for the Hazard Perception Test. This involves driving around a set route as you would normally drive. The route involves all types of roads and you will be asked to do one manoeuvre (out of a possible four). You will only fail if you disobey the rules of the road, or cause a dangerous situation. This is called a Serious Fault. It is also possible to fail by accumulating more than 15 Driver Faults which are minor mistakes, although this is much less likely to happen. I can give in depth help with both the theory and the practical tests, including mock tests-practice tests just like the real thing. 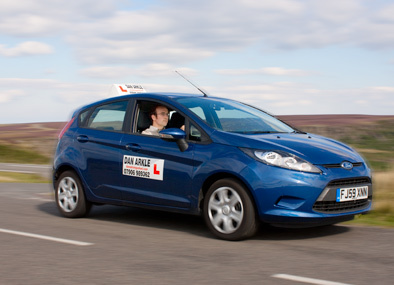 Click here to find out what I will teach you during your driving lessons. Click here for more questions and answers.